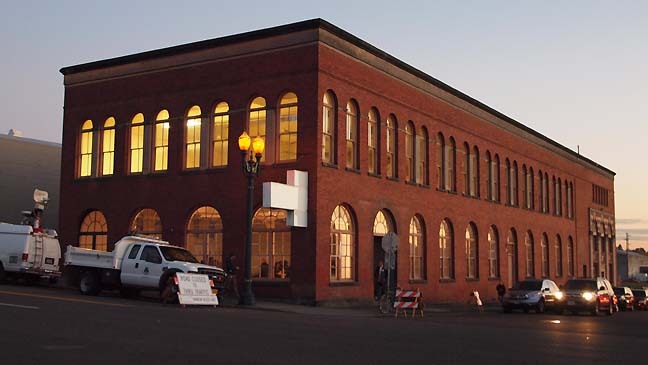 The Old Yale Union (YU) Laundry building in a bid to be the serious contemporary art center Portland has been wanting. The unveiling of the YU contemporary art center on November 2 in Portland felt both energizing and overly familiar. 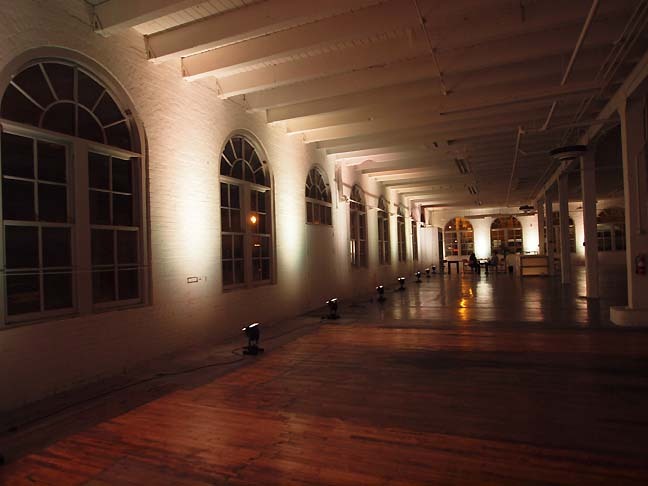 On the positive side an LLC holding company already owns the building and (according to YU founders Curtis Knapp and Aaron Flint Jamison) seeks to transfer ownership of the former Yale Union Laundry building to YU (acronym for Yale Union) a 501(c)3 non profit arts institution as the project gets underway. Located in the inner SE industrial district YU is in an ideal location. The team has already donated and carried out a feasibility study by BOORA, which requires 5-7,000,000 for build out and seismic upgrades (though 10-$20,000,000 seems much more prudent for endowing the programs). Yu already has some finished renovations like the impressive kitchen for major events. a mere 1/3rd of the main gallery space. The plan is multidisciplinary, with 14,000 sq feet of contemporary exhibition space, 4 artist residency spaces, a 100 seat auditorium/flex space for screenings, lectures and performing arts... plus a recording studio, cafe/speakeasy, bookstore, a sauna, an outdoor sculpture space across the streetas well as a publishing facility (already on site and functioning). The publishing, recording studio, bookstore and speakeasy are all potential revenue streams for the organization. The goal is also for 100% energy efficiency using photovoltaics, greywater reclamation etc. All this means that significant planning, funding and curatorial finesse will be required to make the space work. In my experience there are precious few curators who have successfully programmed 8,000+ sq ft. single room shows at the level such a space demands. It simply takes a different level of planning, logistics, sense of scale etc. Such a space demands a tight ship and many major artists will need three or more years to prepare and a residency program is not always capable of producing shows on this kind of scale after 3-6 months. It is possible however... during the PCVA Carl Andre and Portland art students picked out the rocks for his show. The problem lies in the fact that not every artist can scale their projects and process to the space like Andre did. What's more the PCVA was founded on very clear goals and 2 individuals with a lot of vision and know how... today it also takes detailed planning. In 2010 only with complete planning comes funding. Realistically this project will require a major endowment to stabilize funding so the program can take risks. Which leads to the next question. How to program a space like this? I'll go easy on him because he more of an artist (of the iconoclastic/utopian ilk) not a curator... but Flint's presentation on programming did not inspire confidence for many. Though I think he was just following the mode of his last project The Department of Safety... which was purposefully amorphous but didn't have the same far reaching goals as YU. Still, since the programming presentation I've been inundated with incredulous comments. To his credit Flint's goal of keeping things open is progressive but it isn't the sort of thing to say at a public unveiling seeking funding but it can work if the programming has point person for leadership and not just a committee. (programming by committee is somewhat gutless and produces middle of the road decisions) There is a way for openness though... a full time curator is required, but if that person is only developing 1-2 shows per year it would allow room for outside curators to produce 1-2 shows per year. That would turn YU into an intriguing international stop for the globe trotting independent curators that currently only visit Portland to give regular talks. Flint also suggested a retrospective of one artist, Elaine Sturtevant, an interesting choice but an octogenarian simulacra artist in the shadow of Warhol seems much less ambitious than the Museum of Contemporary Craft's recent Ai Weiwei show... Weiwei is a more consequential artist who also deals in the questions of real and fake too. Ultimately, it was not wise to let such an important part of the presentation rest on one name. Names like Mike Kelly and Josiah McElheny were dropped as well as artists who the YU team hopes to give a tour and give input. Both are excellent choices and would have inspired more confidence if they were announced as considering an exhibition... but ultimately don't we mostly want to see artists on the rise rather than in retrospective mode? The director of YU Sandra Percival needs to make certain these on message gaffs don't occur. Everyone speaking for the institution should have media training as well. Right now Knapp comes of as the most energizing speaker of the group, but he has made clear that he isn't interested in running YU... ultimately he's in the founders role as a patron. YU needs to perfect their pitch. Now for the hard stuff. It is strange for a nascent institution to launch itself without a more fully formed message/program and to openly take input on crucial details on everything from governance to programming and staff roles. This has been done before with the doomed Portland Art Center and it's not a good idea. In this case the space itself is exceptional (and owned)... a quantum level better than the Templeton or Goldsmith buildings, which were big and not much else. Still it is programming that is king and without presenting a clear institutional road map, time line and pitch like, raise X dollars in 5 years = finish building + hire curator + full time fund raising staff. At least Jamison and Percival have art backgrounds and connections plus some seed funding. Ultimately this approach creates a lot of buzz but it also creates a bit of a blind man's elephant, where everyone focuses on a small part of the heuristic discussion. Fact remains that to innovate problematically as YU claims they need to have a solid message and program outlined. Right now it's half there. It makes me question if Sandra Percival is ultimately a strong enough communicator to overcome these issues? Not having at least a proto-board and or the beginnings of advisory board in place for this unveiling was a bad idea. You want quiet phase buy in before public roll out. What's more, why is the website so underdeveloped? Then there is the architecture. The building is good but Imm just not impressed with Boora's designs which seem lackluster and reminiscent of typical college dormitories today. 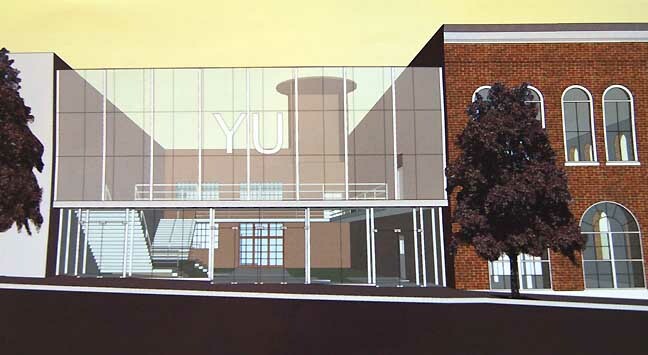 The YU project should look at Steven Holl, (his NYU Psych building and Nelson Atkins Museum projects alone give you an idea) MVRDV (who specializes in making the programmatic openness that Flint is seeking work) and maybe SHoP who also focuses on adaptable renovations. What's more a major architect will also make fund raising easier... often Portland errs by not thinking ambitiously enough and in this case an architect will step up the programmatic discussion many notches. How about an architectural competition to bring out more ideas? These ideas can actually influence the programming of the space in more radical ways and this should be explored if YU is truly interested in an international discussion. 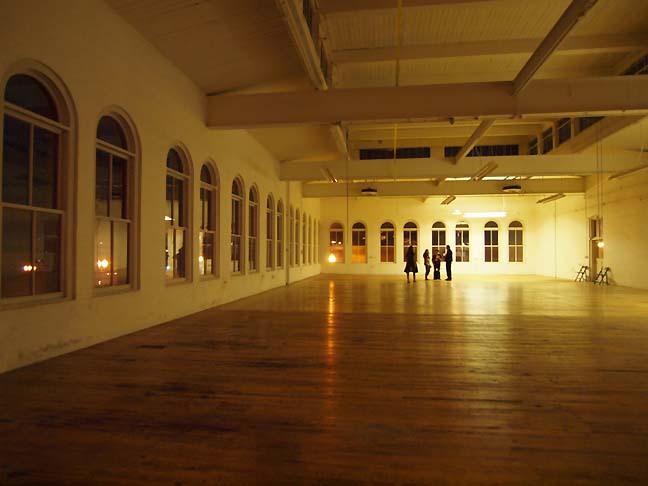 Overall, I sense a great deal of enthusiasm for the space's potential and the fact it is owned already. Amongst patrons and more worldly artists I'm hearing a lot of basic questions regarding the institution. If YU is truly serious they will take their time crafting a less skeletal institutional message. To raise 7-25 million you need a dedicated team with a clear plan... right now they have presented clear potential with unclear implementation. We've heard that before and seen the results and Portland is ready to grow up. I want to see YU work... I'll send them a starter check but they need to pull it together a lot more when they truly undertake their capital and endowment campaign. I like this project but it will have to tighten up quite a bit before it will find support amongst patrons who are already a little gun shy. I am excited that YU is looking at contemporary art- we have been missing this for along time. I am hopeul but hesitant that local artists will be selected and not always the "same old same old".